As parents, sometimes we overlook the importance of reading and numeracy. We give for granted that is something kids will learn at school and we don’t do much to encourage their development. It is overwhelming to find so many adults struggling with numeracy and literacy, and most people blames schools for this result. But as parents we should ask ourselves, how much are we actually doing to help our children today so they can be considered literate adults later in life? Being a skilled reader and writer who can understand mathematics and solve problems will give your child more opportunities to succeed in adult years. By helping them improve their skills we’re helping them being able to communicate confidently, think imaginatively and make informed decisions. Children improve their basic skills by playing, copying their parents or doing things themselves (Read more about this on our post: “6 most important types of play to your child’s development“). Mistakes are part of their learning, so encourage your child to listen, solve problems, talk, read and write. 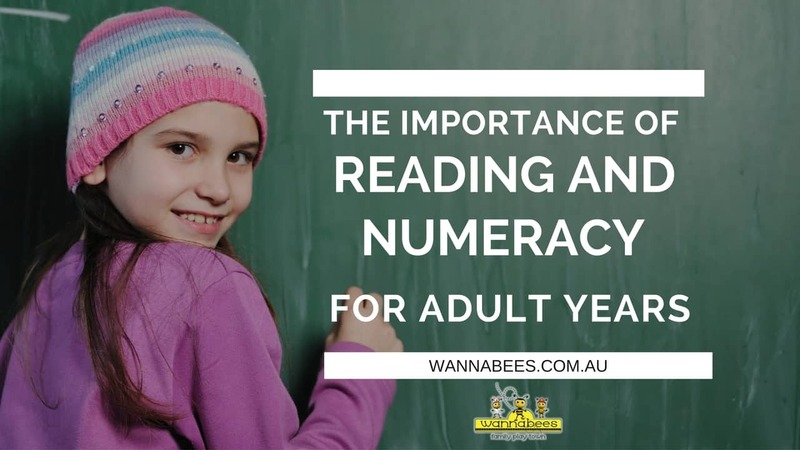 Numeracy, along with literacy, is one of the most important aspects of schooling and life. From paying for groceries and receiving change, to counting and gathering ingredients, numeracy governs a lot of processes and interactions. It is therefore important to make sure children get a good start on numeracy skills. Numeracy skills have changed drastically in the past 200 years. In the 1800’s being considered ‘numerically literate’ was being able to count to 100 and add numbers up to 10. In the modern day, kids are expected to be able to do this by the end of Kindergarten! 1. Count some basic ingredients when you’re cooking. For example, if your recipe calls for 3 teaspoons of sugar, count these out with your child. 2. Games like LEGO have huge numeracy value. Kids can count blocks, identify different sizes, and create patterns and products. 3. Visit websites like NSW Department Of Education contain some awesome resources designed by the Australian and NSW government to help your child with their numeracy. 4. Keep in touch with your child’s school as to the topics they are covering for numeracy. In Kindergarten kids will be learning numeracy without even knowing it – by making patterns and building things with construction materials. By following these tips and monitoring your child’s progress in numeracy by reading their school reports, and helping them with their homework, your child will be helped along the path of numeracy skills. Reading is one of the most fundamental skills a child will learn to develop in their first years of schooling. It’s a common perception that reading is only linked to English-based subjects like History, English, or Social Studies. But read instructions are evident in all subjects – even Maths and Science. Kids interact with schoolwork through reading. How can we give kids a good start to reading? 1. Read to them from an early age. 3. Ask questions about books you have read to them. 4. Ask them to make their own stories about things familiar to them like a family pet, or local place. The suggestions which we’ve listed help kids learn about narratives and building a story. Many reading programs are just about pronouncing words – but what use is being able to read words if you don’t understand their significance? Asking kids about a story will help them identify key events and build their imagination, which is an important component of reading. However, we can’t forget the basics of reading – like identifying letters and numbers. When doing this keep to a standard kind of font as kids haven’t yet developed that the same letter can have different shapes. Trace letters with your kids. Practice saying their sound too, while naming some familiar things that start with that letter or contain its sound. When you’re out and about ask your kids to identify letters on signs and products. This will give your kids a great head start when they begin school. The National Assessment Program – Literacy and Numeracy (usually known as NAPLAN) was introduced into Australian schools in May 2008. It is a series of tests held in May for all students in Years 3, 5, 7 and 9 in Australian schools. They test literacy, numeracy, reading, and writing. The results are compared across Australia’s states to give the government and education sectors an idea of how different states and different teachers are performing in these skills. Results for every school in Australia are posted on the controversial MySchool website for every parent or member of public to view. However, it’s not as simple as it sounds. NAPLAN results can be incredibly misleading. While some great data and ideas can be obtained from NAPLAN results, there are some problems with both NAPLAN and MySchool. These problems result in schools often making NAPLAN optional attendance, and also not teaching to NAPLAN directly, affecting their results. This is an ineffective measure of a student’s capabilities as it only tests their literacy and numeracy skills on two hours of one day. What about the rest of the time? If a child is sick or distracted on a single day, it can adversely affect a school’s NAPLAN results average. When it comes to literacy, reading, and writing, there’s a disjuncture between the skills kids learn in class and the curriculum and the skills measured in the NAPLAN test. Teaching of literacy occurs THROUGH interesting topics in a classroom and is very rarely as explicit as it is in the NAPLAN test. The MySchool website doesn’t account for a school’s quality in other areas such as community work, curriculum, confidence building, sporting prowess, and more. While the problems with NAPLAN are numerous, it can also give parents and teachers an important insight into their child’s schooling. The data obtained from the tests isn’t useless. It highlights Australia’s strengths and weaknesses when it comes to school – while also highlighting inequalities among Australian schools. Wannabees Family Play Town a unique indoor play centre in Sydney, Australia, has developed a program to help your kids improve their skills. The Learning Bees program helps kids develop reading skills in a fun and educational environment. It has also a huge focus on different numeracy skills such as counting, making patterns, and building craft with basic measurement skills.